There’s something very special about wandering through a woodland in autumn, with the sound of a stream tumbling in a gorge below your feet and leaves floating down all around you. As a wet, windy and (in Scotland) rather chilly summer draws to a close, I’m sure I’m not the only one hoping for some crisp, clear weather in which to enjoy the colours. With this in mind, I’ve chosen three of our favourite places for a walk – beautiful in any season, but especially so during the transient magic of autumn. 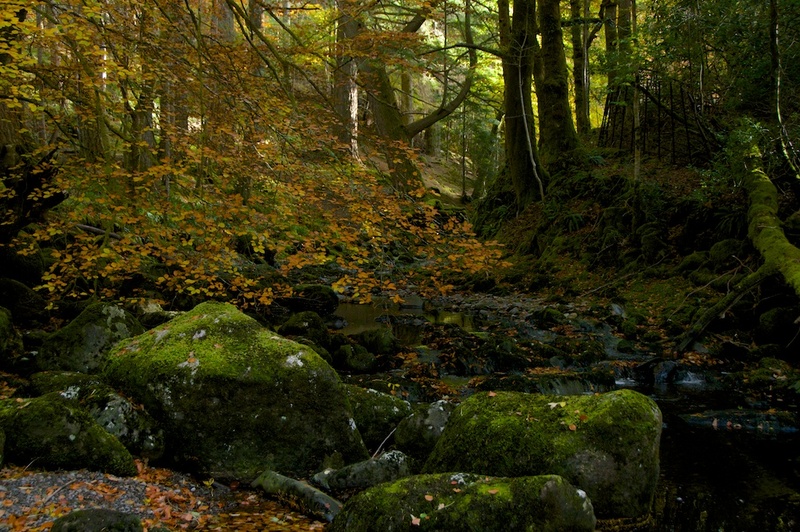 In the Barcaldine Forest of North Argyll, a lively burn cascades down the hillside before flowing out into Loch Creran. 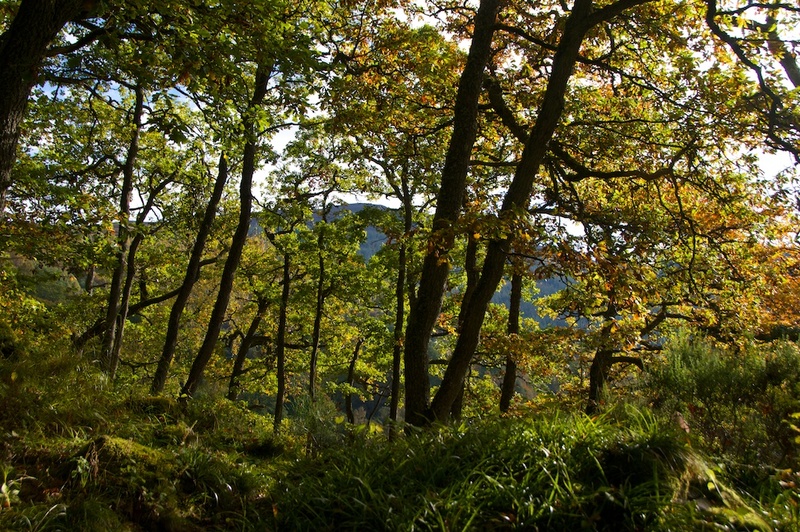 The name Barcaldine is from the Gaelic ‘Am Barra Calltain’ meaning ‘hazel summit’, but hazel is not the only species present: the woods are a lovely mix of conifer and broadleaf, including some magnificent Douglas firs of enormous girth, and graceful old beech trees that seem to drip with caramel and bronze. 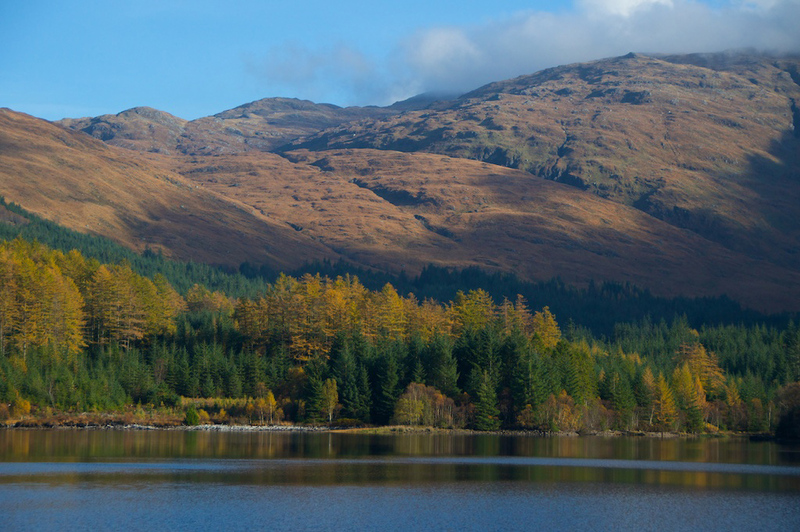 From the car park you can choose from a number of waymarked trails, following a stream uphill, over bridges and alongside a steep-sided, shadowy gorge until you come out into a wide clearing around the Glen Dubh reservoir, with wonderful views over Loch Creran and beyond. You might glimpse a red squirrel if you’re lucky, but in any case you can marvel at the luxuriant growths of lichen and moss, a testament to the mild, moist climate. More information at Forestry Commission Scotland. 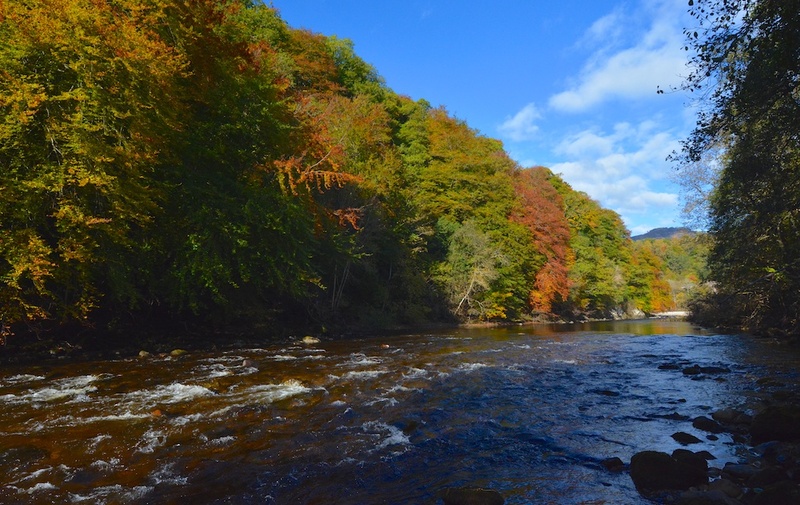 On a grander and more majestic scale, the Pass of Killiecrankie in Highland Perthshire must be one of Scotland’s most photographed autumn woodlands – and it’s easy to see why. 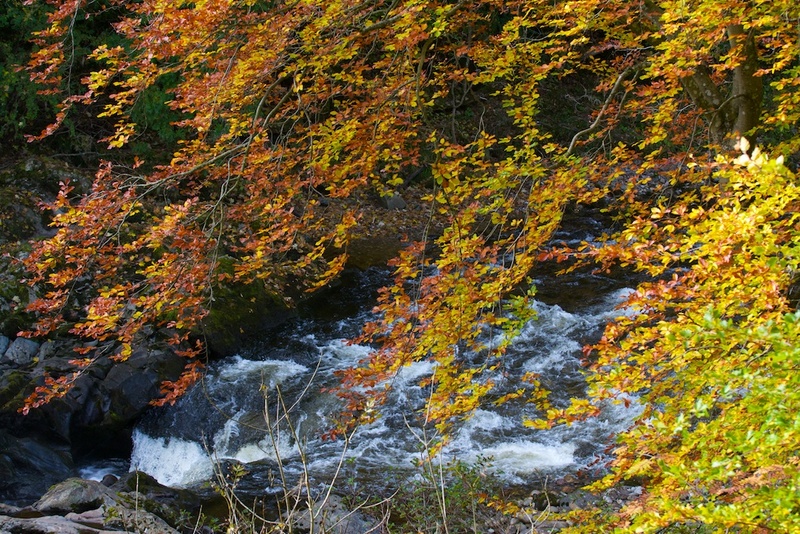 Vibrant colours of oak, beech, sycamore and rowan are reflected in the River Garry as it meanders through a deep gorge. The lighting conditions of half-shadow, half-sunshine can be a challenge for photographers, but luckily there’s a bridge where you can stand and gaze up and down the river, giving a better viewpoint. It’s impossible to visit Killiecrankie without reflecting on the battle that took place here on 27th July 1689. At sunset, two thousand Jacobite soldiers led by John Graham of Claverhouse (1st Viscount Dundee) poured down the steep hillside to attack British government forces commanded by Hugh Mackay of Scourie. The rout turned into a massacre, and there is a sense of sadness here still. A recumbent stone lying at right angles to the path is said to mark the grave of Brigadier Barthold Balfour, killed while his infantrymen fled towards the river. Another point, where the river narrows, is called ‘Soldier’s Leap’, commemorating a soldier who leapt across the falls to safety. 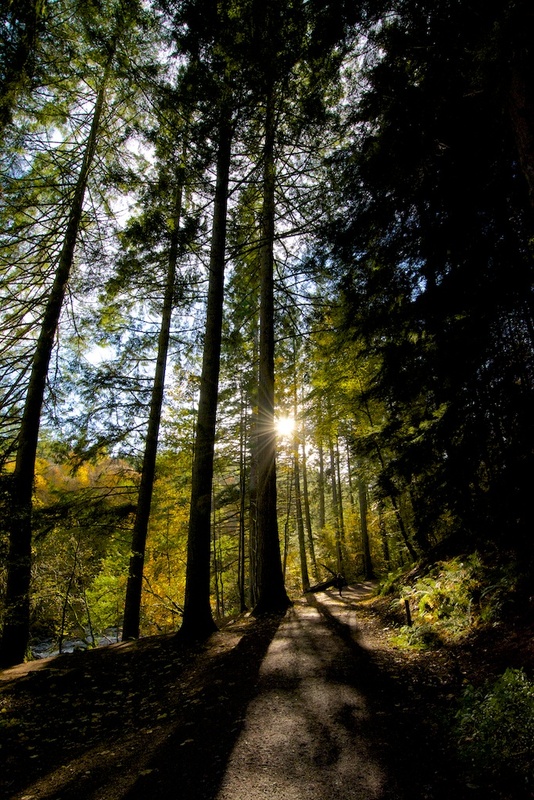 Some of the tallest trees in Britain can be found in the woods of the Hermitage near Dunkeld. These are Douglas firs, and they stand next to the bridge across the River Braan where it froths and foams over the Black Linn Falls. 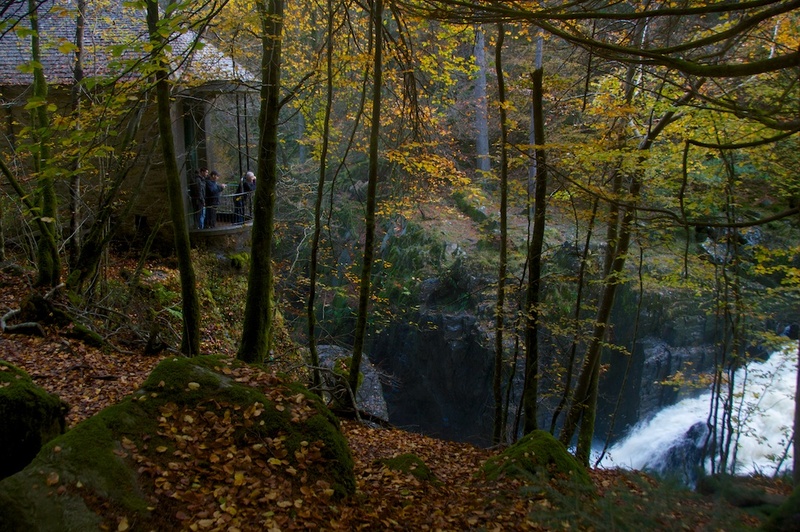 On a rocky promontory overlooking the falls is a curious little building known as Ossian’s Hall, created in the 1700s and named after the bard of Fenian legend. The room was originally lined with mirrors so that visitors could enjoy the illusion of having water cascade all around them. It’s invigorating to stand on the platform right above the falls and gaze down at the powerful white water. You can get soaked by the spray, however! The woodlands here are particularly rich in fungi – whole colonies of them, spreading out from the base of trees or sprouting from their mossy trunks. Do you have your own favourite woodland for autumn walks? If so, I’d love to hear from you. The Woodland Trust’s Charter for Trees, Woods and People is due for launch on 6th November 2017 – the 800th anniversary of the 1217 Charter of the Forest. It aims to celebrate and protect our natural assets of trees and woodlands. To find out how you can get involved, click on the logo and visit their website. Thanks, Scott! I’m really looking forward to it. Great photos, the type of Autumn we don’t really see here, (well only in small pockets anyway). Glad you enjoyed them, John! Where is home to you, in that case? What a wonderful place in which to enjoy the colors of Fall! A gorgeous landscape! It certainly is – sometimes the autumn colour is so fleeting, and some years it’s better than others, so this year we’re holding our breath for a good one! You have done a great job capturing all the colors of green and other Autumn colors. Massive evergreen forests here. Thank you, Greg! It’s a lovely time of year. Thank you, Glenda, glad you enjoyed it! A pleasure to share them. It’s my favorite time of year here in New England, but oh how I would love to enjoy the season in Scotland, too. Thank you so much for a wonderful introduction to Autumn. If wishes were horses, I would transport myself into any of the places you described … in fact, almost can! Thank you! I love the idea of wishes being horses! 🙂 It seems right somehow! Really pleased to hear you enjoyed this little autumn tour. I’m sure your colours in New England are beautiful too. A lovely selection and some beautiful photos. 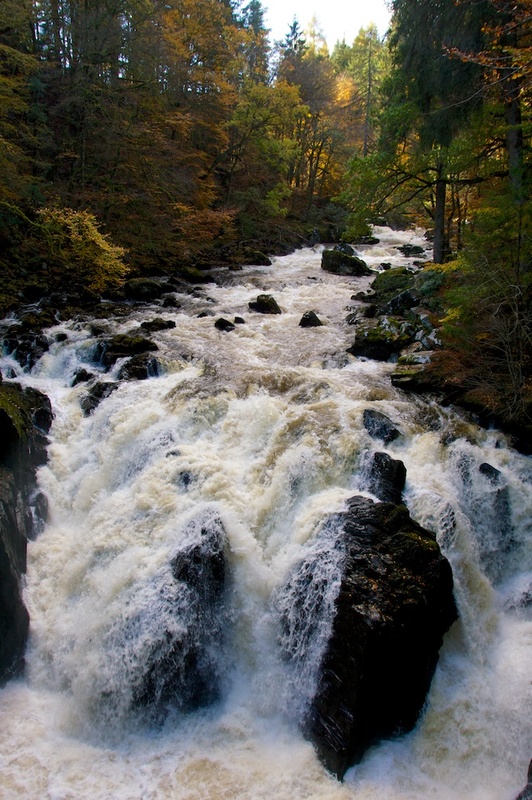 I’ve seen churning white water at the Hermitage just as it is in your photograph and it’s a powerful sight. 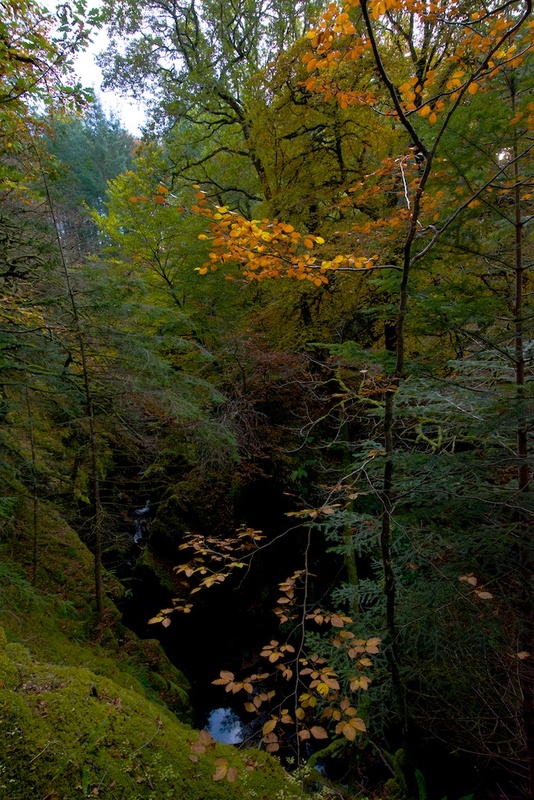 Have you ever walked up the paths beside the Falls of Bruar, just behind House of Bruar off the A9? That’s somewhere I enjoy visiting in the autumn. Another place that springs to mind is Kirkmichael and the walks that go up through the log cabins there. It’s a good place for interesting fungi. Thanks, Lorna! The Black Linn falls were magnificent that day. No, I don’t know those paths by the Falls of Bruar – that sounds a really nice walk. Thanks for the tip on Kirkmichael too – would love to discover some unusual fungi. They are quite good around us at the moment – perhaps a result of the damp summer!? Glorious. Thank you for sharing!